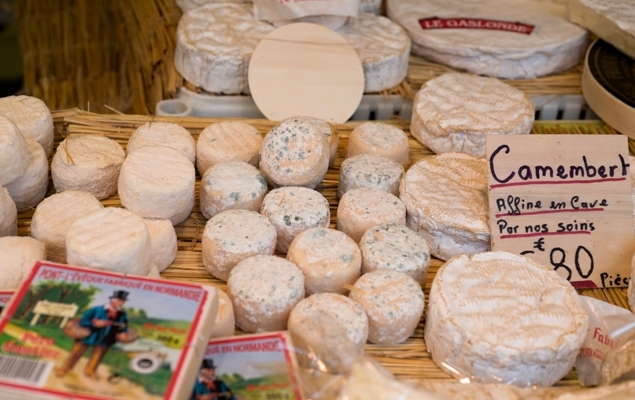 There's no better destination for cheese lovers than France. Cater to this delicious indulgence by sampling famous cheeses from across the country to discover a slice of French cuisine at its best. Many of us eat cheese as an appetizer, but the French serve it after the main meal with the salad course. We love it both ways and while the French may have their age-old cheese customs, there's nothing wrong with a light meal of wine, cheese and baguette! There are hundreds of different kinds of cheeses in France and you could spend a lifetime sampling and selecting your favorites. The best cheeses, only 45 types, have been awarded the highest honor, ‘Appellation d’Origine Controlle’ or AOC. This is a designation awarded by the French government awarded to the finest cheeses and wines, the guarantee that it has been made using only specified ingredients and an age old process in a specific region, all of which is carefully controlled. Look for the special blue and yellow labels applied to the wrapping showing it has received the distinguished Apellation d’Origine Controlle’. AOC cheeses must be made from milk produced only by cows in that specific region. The cheese can only be produced in that region, not in a factory elsewhere. For example, Camembert can only be produced in Normandy by cows that are raised and pastured in Normandy . During production, strict criteria must be followed to maintain the‘savoir faire’ of making that cheese, which has been passed down from generation to generation. 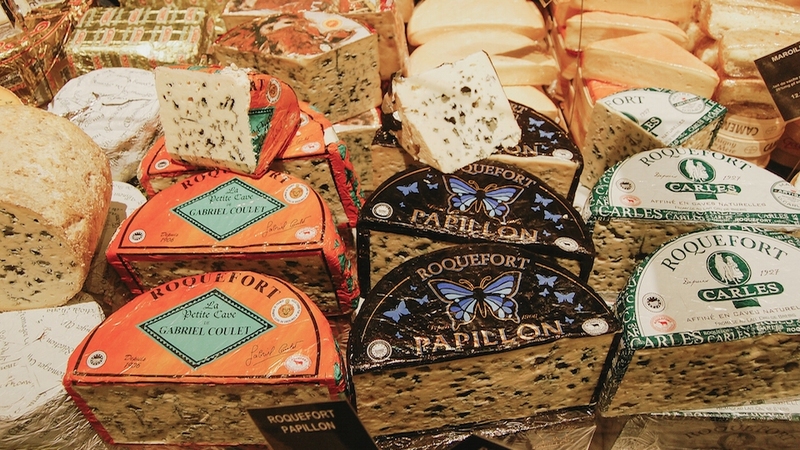 It all began in the 15th century with Roquefort that was regulated by parliamentary decree. This special protection moved from cheeses to wines and even to butter. The label protects the producers from other regions counterfeiting their fine products. You will find the AOC on many wines as well, distinguishing a defined geographic origin and production process. The AOC award slowly spread to wines and butters in France called the Appellation d’OrigineContrôlée (AOC), a certification granted by the French Government to certain wines, butters and cheeses. 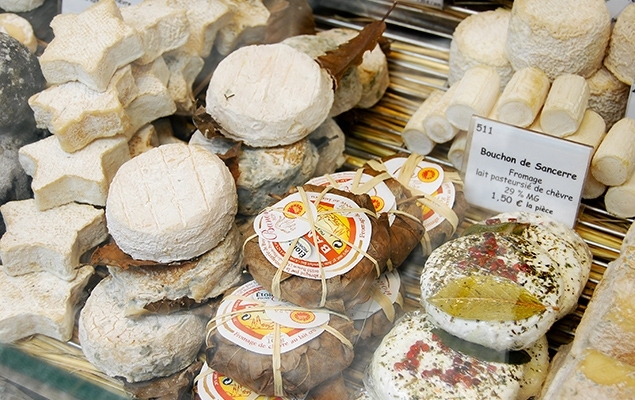 Some cheeses have seasons like fruits and vegetables, so simply ask the shop owner. For example, we love Beaufort in the Fall, after cows have lived in summer pastures and produce richer milk. Beaufort found in the fall and winter is grainer than summer beaufort and has a stronger bite. Even the ever popular Camembert is said to be better in the spring. The French say that Camembert is better in the spring, when the cows have better quality pasturage and therefore produce better milk. One famous seasonal classic that appears in the spring is Vacherin Mont d'Or. This delicious cheese has been made in Switzerland and France sinc the 18th centry, with a velvety texture and delicious strong flavor. with a velvety texture and delcious strong flavor. If you’re in Paris during Vacherin season, you’ll see signs for it everywhere. The best way to eat it is to cut off the rind on the top and eat with a spoon. There was a recent problem with Vacherin a few years ago, traced back to listeriosis bacteria found at a Swiss producer, but by the time this was found, significant damage to French producers had been done. As a result, it is now illegal to important French vacherin to the United States . However the production standards are more rigorous than ever and it’s worth eating if you are lucky enough to be in France when Vacherin/Mond d’Or is in season. While many supermarkets have specialty cheese counters, most offer factory-made cheeses from large producers. These cheeses can be excellent, and they are certainly what most of us grew up with in the United States -- but they can lack variety and flavor. I buy them for basics. Squeeze Before Buying, Many packaged cheeses should be squeezed to check for ripeness: Camemberts and Bries are usually shipped early, so they ripen on the shelves or at home. You must squeeze the soft ones such as Camembert and Brie to make sure it will be ripe when you’re ready to eat it. The French call it ‘fait’ or done and if you’re eating it immediately, the softer the better. Same with certain goat’s cheeses, where you won’t see it looking like it’s starting to melt at the top. Supermarket cheeses can be excellent, and good value if you’re going to use them for cooking. For example I buy soft goats cheese in the supermarket if I’m going to use it to melt on apple slides for a green salad. Same with packages of Roquefort which are fine for salads, but lack intensity of the best, ripe Roquefort’s you can find for the cheese course. 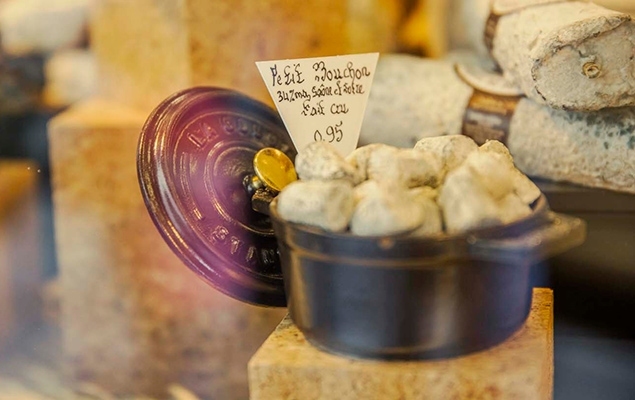 Most French people will tell you that the best cheeses come from specialist cheese shops. These shops search out the smaller producers who specialize in a certain kind of cheese, so if you have a favorite, you’re sure to get the greatest variety. We have our favorite cheeses and search out the shops that specialize in them: St. Marcelin or St. Felician,Camembert or Epoisses or more. They refuse to buy from factories, and most of their cheeses come from small farmers who specialize in one kind of cheese. Their selections are often excellent. Ask for help from the shop assistant. Explain what cheeses you like and ask for their suggestions and favorites. 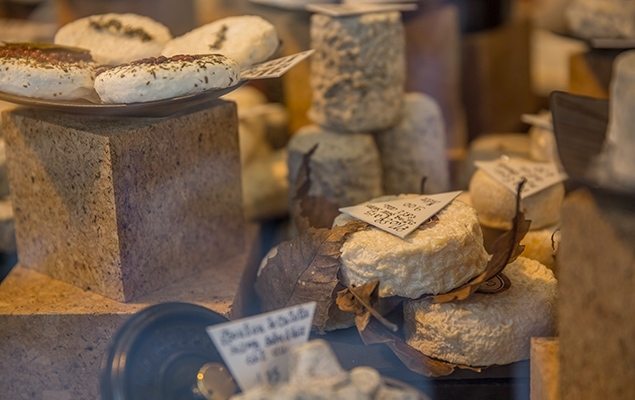 Find out what a cheese shop’s specialty is: Some shops specialize in goats cheeses while others specialize in those made from cows. If it’s a soft cheese, always let them know when you’re planning to eat it, and they’ll squeeze packages of Camembert, Brie and other until they are sure of the one that will be ‘just so’ on the day you wish to eat it. It’s an important part of the food adventure in France .